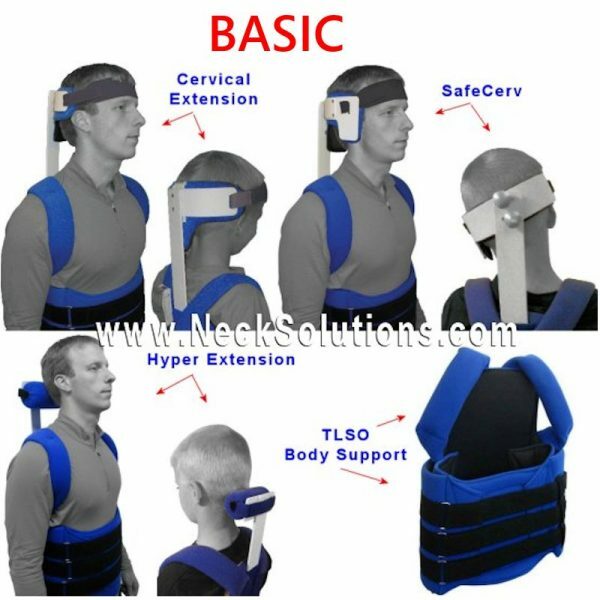 Basic Head Support System Permits Sitting, Sanding & Walking. Includes TLSO Body Support & Your Choice Of Head Support. From Drop Head Syndrome To Torticollis & Conditions Requiring Backward Head Support. Basic System Uses 1 Flexible Panel (Code L0454) – Plus Version Has 4 Flexible Panels (Code L0456). 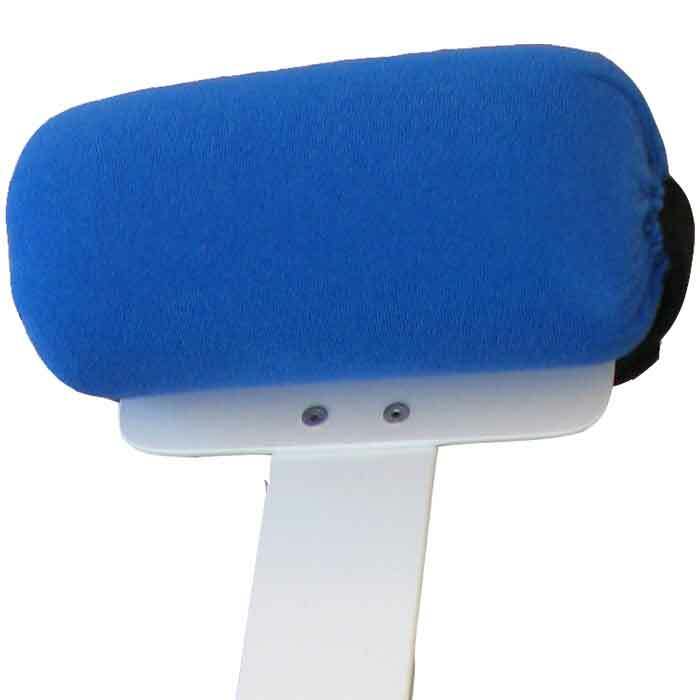 Head Support Attachments Are High Temp Kydex (Code L0999). PDAC/Medicare Approved. Customizable & Hygiene Item – Non Returnable. Professional Measuring & Fitting Required. 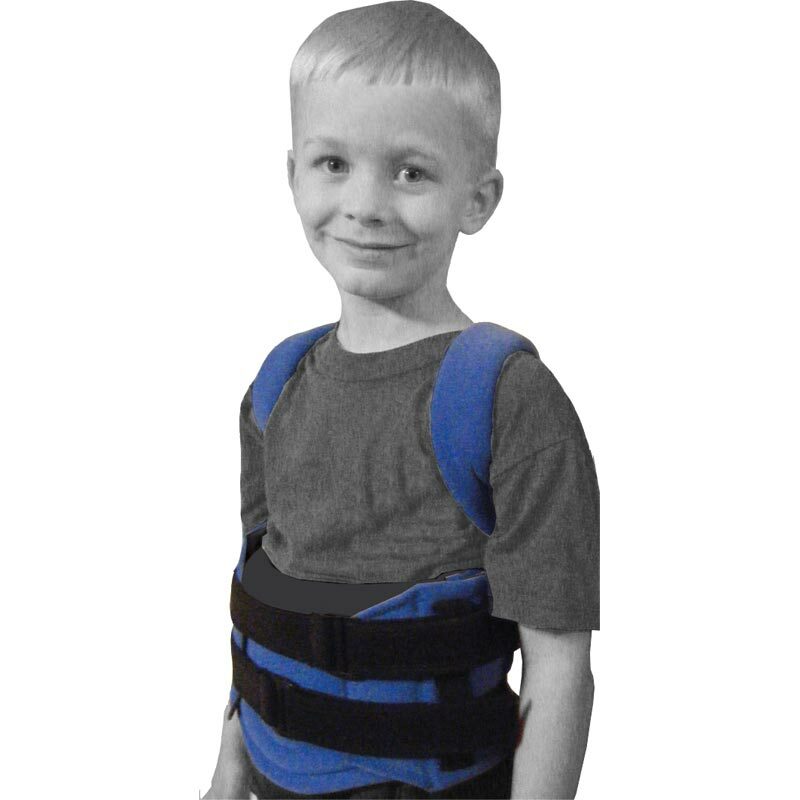 For those who require a head support system that permits sitting as well as standing and walking, you will find this system includes everything you need from drop head syndrome to torticollis or wry neck as well as conditions requiring backward support. 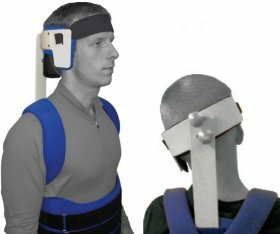 The system comes complete with the body portion and your choice of head support depending on the condition and type of support required. 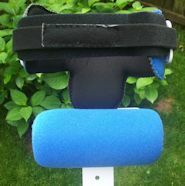 Both used as support and corrective system for children and adults with poor or altered head control. The Basic uses Code L0454 and has 1 flexible panel for the back. The 456 uses code L0456 and has 4 overlapping Kydex shells for greater stability & tri-planar control. 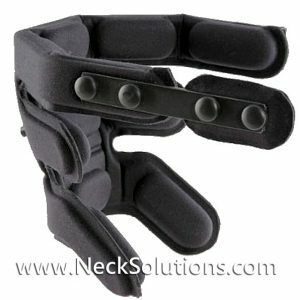 The attachments for head support are High Temp Kydex and use code L0999. PDAC/Medicare Approved. Made in U.S.A. These are professional grade products and it is recommended to have a professional assist with measurement, customization and implementation. We do not provide used systems or samples. Considering these products are required to be modified and are for single patient use, we do not allow returns on opened and/or used supports. Please Note: Infant, Toddler & Child Sizes Are 1 Size Only for both height & circumference. 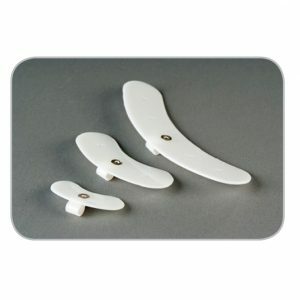 Select these for both measurements, then choose head support. When we talk about neck and head issues and it is common to see after spinal cord injuries, brain injuries, strokes as well as conditions such as congenital torticollis, parkinsons, ALS, that there is a lack of neck muscle control. This can lead to problems with head posture. We see issues with tone in the extensor muscles, however, we often see conditions that result in a drop head syndrome or problems with lateral or side control. In extreme cases, we are sometimes having to take the ear from the shoulder. This can lead to breathing problems, being prone to pneumonia because they are not getting proper expansion of the lungs. This can also cause a lack of oxygen to the brain, leading to disorientation. They can also have problems swallowing. The Extension Support is for problems with the head dropping forward. It can be with or without tone, It can be that a lack of tone starts the head leaning forward, then the weight of the upper body continues that forward head motion as gravity works against us. We see patients from infants on up that have this problem, which could be a lack of tone or hypotonic, commonly seen in kids with cerebral palsy. As they develop tone, you want to reduce the spasticity. 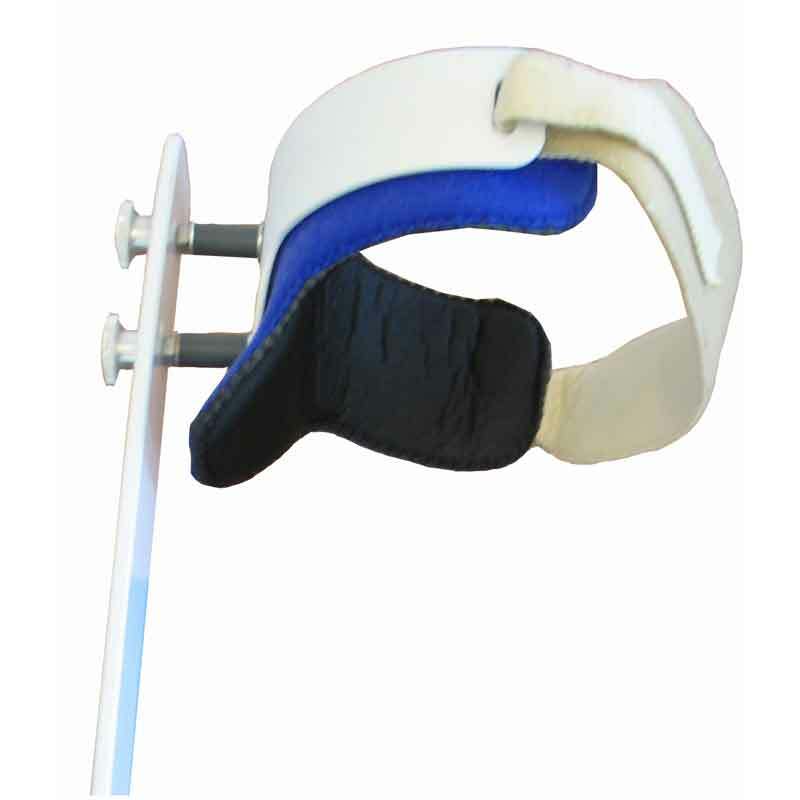 The neck extension support is flexible with the fishing pole like technology that will bring the head up gradually. 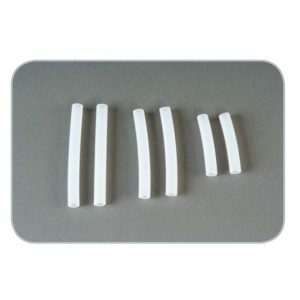 It is heat moldable for a custom fit and for adjusting according to the demands and progression of the condition. 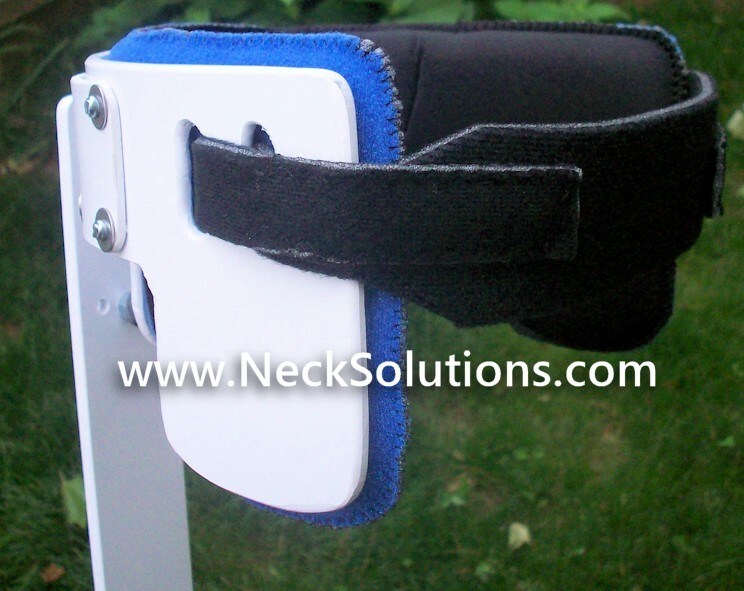 The head support system allows an upright posture when sitting as well as standing. 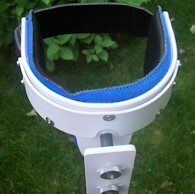 The long piece slides into a pocket in the body support portion of this head support system. The body support system assists in bringing the head up, while the extension support works to support the head with a padded back piece and forehead strap. 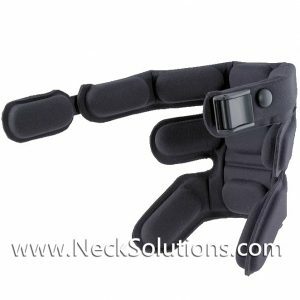 The extension support is automatically sized to the body support when ordering, working as a single head support system. By bringing the head up, they are able to view their environment and remain oriented. It assists with eating. Some of these children and adults need someone to actually hold their head up so they can eat. 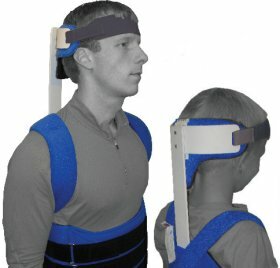 With the head support system, their head is up, there is nothing under the chin to restrict them. Because of the neuroflex technology used, it can be restorative in that the neck muscles are being exercised when there is pulling against resistance. 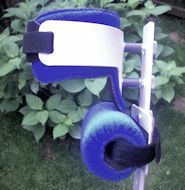 So, it is possible in some cases that you can gain enough muscle control that the support can be progressively discontinued or used for maintenance. 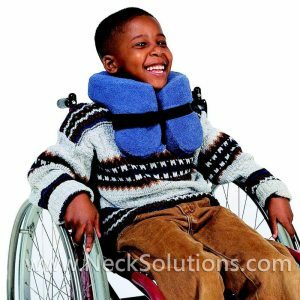 This support is for patients who have left or right leaning head and neck issues like torticollis, cerebral palsy, brain and spinal cord injuries can result in this torticollis dystonia condition. It has extra side support that goes on the side of leaning and/or turning: right head lean = right safecerv. This support has arced holes in the vertical slat piece. 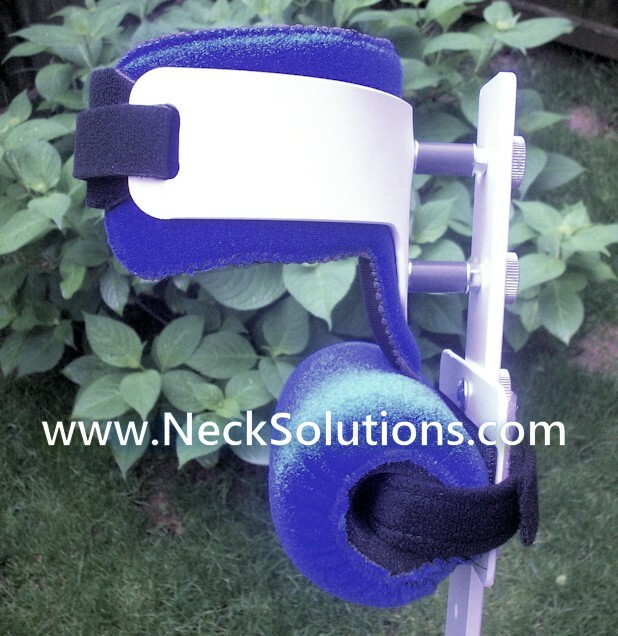 If the patient can comfortable be ranged to almost neutral, you can attach the support to the vertical piece in a straight up and down manner, aligning the holes straight. Never torque the head. Use gentle massage of the shoulders, having the therapist of caregiver bring the head up very gradually. If there is significant leaning, you set it up using the arced holes which permits a 3 dimensional component to accommodate the altered posture. It is heat moldable and also incorporates the flexible technology similar to a fishing pole. 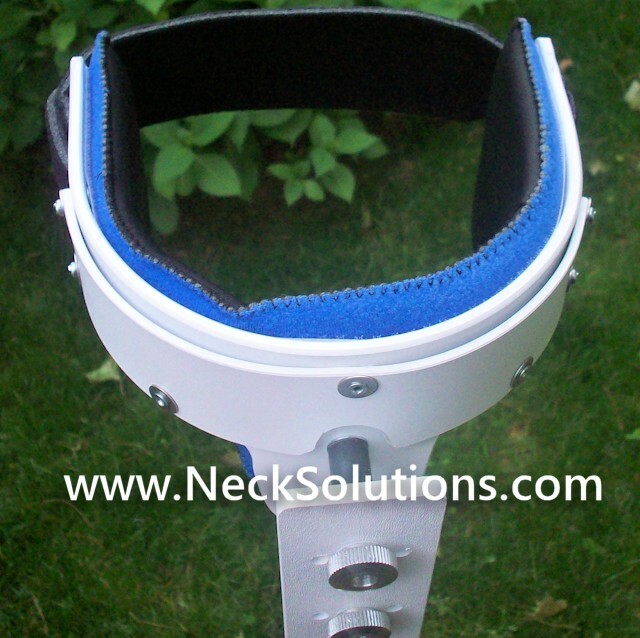 This allows the restorative part of the head support to do it’s work and the patient to comfortably pull into the tone and go back. It comes in 2 sizes: Measure around the head (circumference) Small (Less Than 22 inches) | Large (Greater Than 22 inches). We are looking to relax the tone to allow muscle inhibition. Then we get a prolonged low load passive stretch to re-lengthen shortened tissue. This is a gradual process. It takes about 6 weeks of prolonged low load passive stretch to realign the actin and myosin in the sarcomere units residing in the muscle belly, to prepare it to be re-lengthened. So, if we are overstretching and too aggressive, we run the risk of doing harm, causing damage to connective tissue. 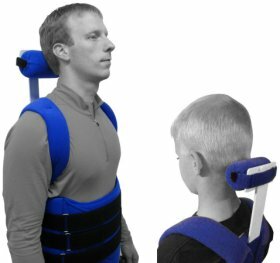 The SafeCerv head support slides into the body support that is automatically sized for the back height of the body support you choose, for a total, custom head support system. It is also heat moldable for additional customization and accommodation. With the head support system, you can look to make changes in about 8 weeks. If they are progressing towards midline, you can change the screw attachments and/or heat mold to accommodate further correction if indicated. At this point, you can do mild stretching towards the opposite side, aiding in re-lengthening the shortened tissues. 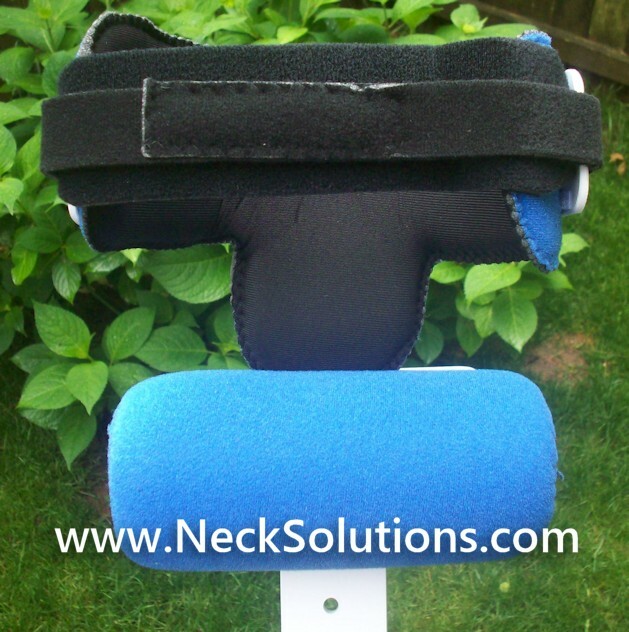 This support helps prevent backward motion of the head. This is usually a result of some type of brain issue like stroke, cancer, anoxia, kids with cerebral palsy, shaken baby syndrome, whatever the reason, the patients are loading backward. Often these patients will recline in a chair or sofa, and all this does is feed the tone. What we want is a 90 degree hip angle to break the tone. The hyperextension support slides into the body support similar to the other supports. 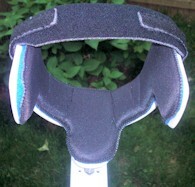 The padded portion goes against the back of the head wherever you find it does the most efficient job. 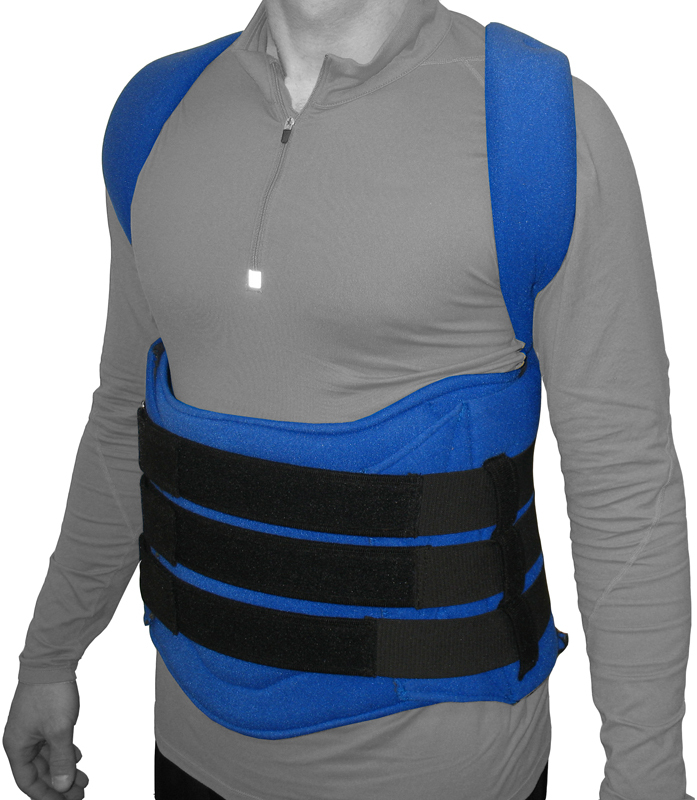 The vertical slat is heat moldable to range the posture in the most efficient and comfortable posture. These patients are not typically walking around, because if the tone sets in, they would fall backwards. 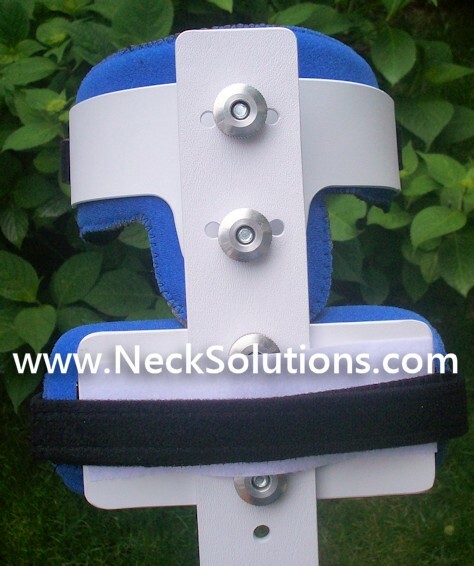 It is always nice to incorporate the head support system as early as possible in order to try to minimize the condition and improve quality of life. That is why they are available in sizes from very young to adults. The flexible technology does a good job of holding the head forward along with the 90 degree hip flexion posture. With correct use, you should see your patient relax. This is the foundation of the system, supporting the head attachments and allowing support while sitting or standing. 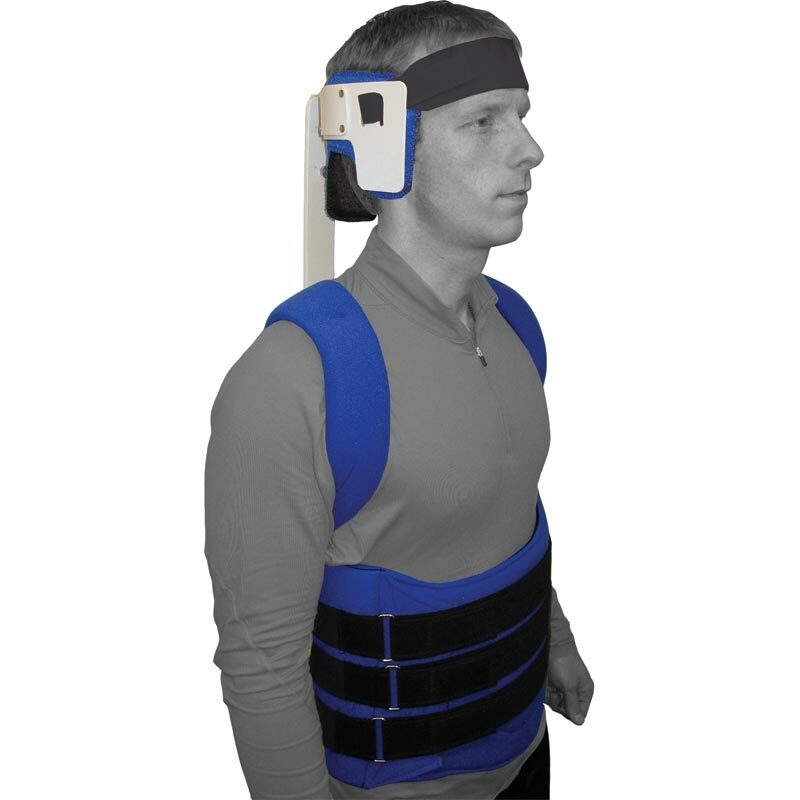 It works to correct body posture as well, which adds a measure of stability and assistance to the head support. 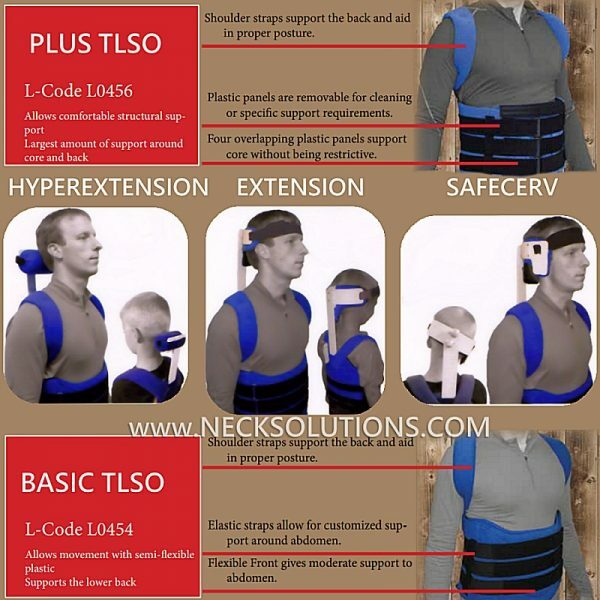 This is the basic body support and is the safe spine system TLSO. We do have the version with more inserts providing more active body posture restoration along with the head support, however, this is the basic body support used for those with mainly head support needs. 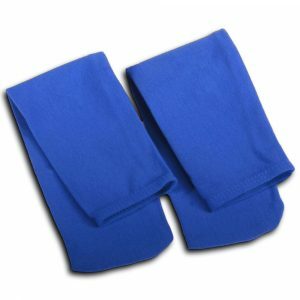 It has a heat moldable back insert and one non-removable front flexible insert. The belts are attached from bottom up, taking in consideration gravity – moving everything up. Put on in the lying down, face up position. In this position, the spine is elongated, so we want to capture that position and then fasten the support. So, while they are lying down on top of the support, allow the patient to rest a while and encourage some mild stretching to assist in the spinal elongation prior to fastening. By lying down, we can also capture the abdominal contents which, when standing, can pull down on the spine. So, we get an additional measure of support by placing it on in the supine lying position. Assist the patient up to affix the shoulder straps. 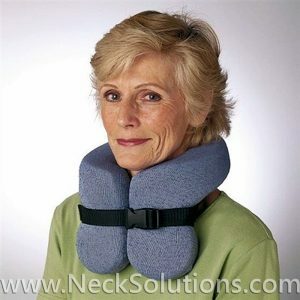 This plus has flexible inserts which helps assist upright posture. Then place the shoulder straps on. The shoulder straps are well padded alleviating any pressure. There is a wide range of methods to fasten the straps, however, most cases will use the “x” configuration. The belts are elastic, make sure they are not too tight. Make sure they are comfortable sitting without pressure at the bottom on the thighs, or at the top on the chest – be cognizant with females regarding the chest, making sure the support is comfortably under the breast tissue. The material is patient friendly, comfortable and allows air flow, however, it is recommended to use over clothing and not directly against the skin. 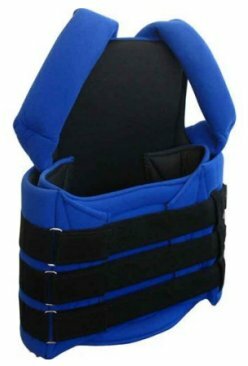 The support is designed to provide compression without cutting into the patient, which can result in a compensatory posture, thus creating unwanted muscle tone. The back of the support has a pocket that the vertical slat of the head supports slide in. All of the head supports fit into the body support. 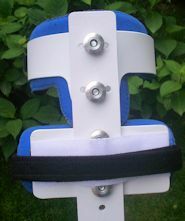 This support is a TLSO (thoraco-lumbar support orthosis). The shorter heights will have only two straps. Custom applications are available. Additional cost and time applies according to needs. Click on pictures below to see larger images. 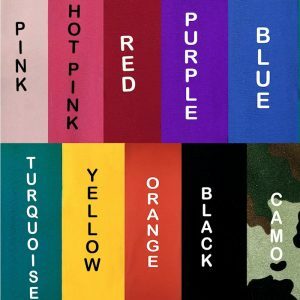 Please contact us regarding any customization needs. Professional assistance required for all applications.